Gorilla Tracking – To date the national park comprises of ten habituated groups open to tourists, allowing for a total of 80 gorilla permits per day and only 8 people allowed to track each single gorilla group. Tourists spend an hour with the gorillas. Climbing of Karisimbi volcano – the Karisimbi offers travellersa 2 day trek with overnight camping at an altitude of 3,800 m.
Climbing of Bisoke volcano – one day. Tour of the Twin lakes of Bulera and Ruhondo. Visiting the tomb of Dian Fossey. “In the heart of central Africa, so high up that you shiver more than you sweat, are great, old volcanoes towering up almost 15000 feet, and nearly covered with rich, green rainforest – the Virungas” – Dr. Dian Fossey describing the intensely beautiful mountain range on which she spent the last two decades of her life studying Rwanda’s endangered mountain gorillas. Protected within the Parc des Volcans, the lushly forested slopes of the Virungas form an appropriately dramatic natural setting for what is arguably the most poignant and memorable wildlife experience to be had in the wilds of Africa: gorilla tracking. The exhilarating climb to the gorillas’ habitat of shady bamboo forest offers fantastic views in all directions, before trekkers are immersed in the mysterious intimacy of the rainforest, alive with the calls of colourful birds and the chattering of the rare golden monkey. 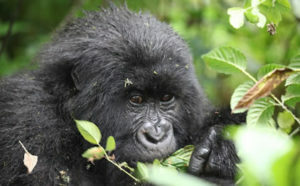 Nothing can prepare one for the impact of trekking mountain gorillas in their natural habitats. up to three times as bulky as the average man, yet remarkably peaceable and tolerant of human visitors. Nor are these words to describe the thrill of recognition attached to staring deep into the liquid brown eyes of these gentle giants, which share some 97% of their genes with humans. That mountain gorillas survive today is largely thanks to Dian Fossey, who is buried at her research center in the Virungas alongside the animals to which she dedicated her life. Fossey became a household name following the release of the biographical film Gorillas in the Mist, set and shot on location in the Parc National des Volcans. Critical and public acclaim ensured that Gorillas in the Mist also served to raise international awareness of the plight of the mountain gorilla. A mere 300 of these gentle giants survive in the wild, half of them resident in Rwanda, where four habituated groups – ranging in size from 7 to 33 individuals – can be visited by up to 32 tourists daily. The main base for gorilla tracking, Ruhengeri, is a small but bustling market town situated 15km from the base of the Virungas. Boasting a wonderful sub-montane setting, and an excellent range of cheap to midrange hotels, Ruhengeri is an agreeable place to spend the night before one goes gorilla tracking, as well as being the obvious base from which to explore the little-known but compellingly beautiful Lakes Burera and Ruhondo. Alternatively, visitors seeking a higher level of comfort could base themselves in Gisenyi or Kigali, and – with an early start – head to Ruhengeri as a day trip from there.